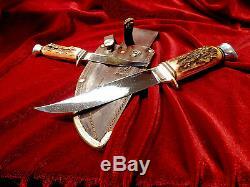 SOLINGEN GERMANY fixed blade knife SET. 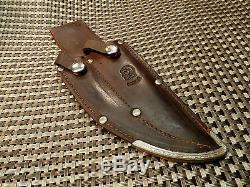 The Original Othello "Double Pocket" vintage leather sheath is also included. The matching 3-Piece set are in exceptionally good condition for their vintage age. 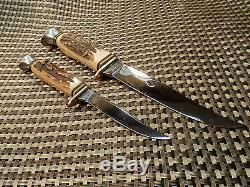 I believe the stunning knives are from the 1950's - 1960's era. 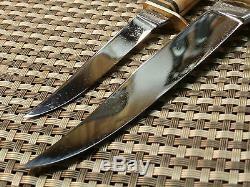 The knives of Solingen Germany are known worldwide for their quality and attention to detail.... These vintage hunting knives are no exception. The German knives feel solid, well balanced, and heavy for their size. 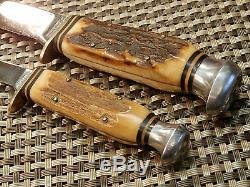 This hunting knife combo features beautiful stag antler / bone 4-Pin handles, with brass finger guards and shiny aluminum pommels. Everything is very secure, and the steel blades are full with pointed tips. Collected, making this condition even more rare and difficult to find. The larger Solingen knife overall is: 8 1/4. 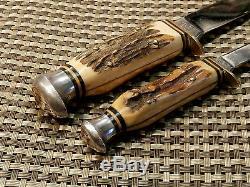 The blade length is: 4 5/8. The smaller Solingen knife overall is : 6 1/4. The blade length is: 3 1/8. The larger knife is stamped under the image of a man's head. The other side of the larger knife is stamped. T he smaller knife is stamped under the image of a man's head. The other side of the smaller knife is stamped. There are NO chips or cracks in the either 4-Pin stag/antler handle. The beautiful jigged bone pattern of the handles displays natural dark grooves and also raised areas. 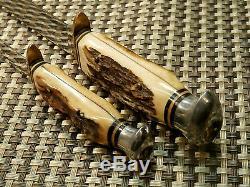 Each handle has natural aging tones and lines that occur with real bone or antler. Everything is tight with NO movement and the 4 brass pins in each handle are well secured. The handles have secure cream color and black spacers near the brass finger guards and shiny aluminum pommels. The brass guard on the larger knife is 1 1/4 long.... The smaller brass guard is 1 long. The fittings are in very good vintage condition with a nice patina. (Please view photos for details). The quality German steel blade on the large knife appears to have not been re-sharpened, and looks full with a pointed tip. The larger vintage knife blade is still mirror-like with a nice patina and there are No blade edge nicks. The bright upswept hunting blade is smooth to the touch, but has tiny surface pitting from being stored in the sheath for so many years. The quality German steel blade on the small knife appears to have not been re-sharpened, and looks full with a pointed tip. The smaller vintage knife blade is also mirror-like with a nice patina, but has a few light surface scratches. The fixed blade is smooth to the touch, but has tiny surface pitting and a few tiny age specks from being stored in the sheath for so many years. 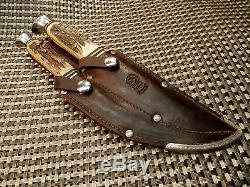 The original " double pocket sheath" or leather case is included, and holds both knives securely. 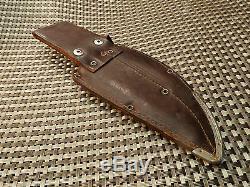 This vintage "OTHELLO" dark brown leather sheath has 8 metal rivets, intact stitching, metal tip protector, stiff throat areas, and belt loop. It also features a working metal snaps on the leather straps and holds both knives securely. 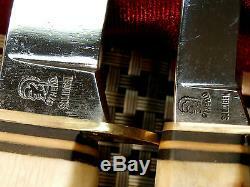 The front of the sheath is stamped: With a mans head and the word: "OTHELLO" underneath. With that original patina of time appearance not yet achieved with newer knives. Some military knifes, and a variety of collectibles. Please be patient and keep watching as I have over. Old knives in my collection and will be listing all of them. International buyers we are glad to answer your questions. All descriptions reflect my honest evaluations of the items condition and appearance. Please view photos carefully to determine your evaluation. 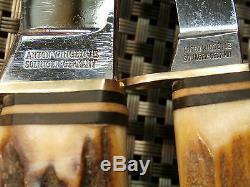 The item "RARE 1950s KNIFE SET SOLINGEN GERMANY HUNTING COMBO Vtg STAG BONE OTHELLO & CASE" is in sale since Sunday, March 20, 2016. 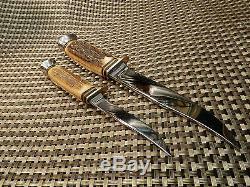 This item is in the category "Collectibles\Knives, Swords & Blades\Fixed Blade Knives\Vintage (Pre-1970)\Custom Manufactured". The seller is "aux-power" and is located in Coos Bay, Oregon.